This page will cover common questions in relation to setting up a subwoofer correctly, including basic calibration. Another question we frequently encounter is which cable (interconnect) should be selected, or more specifically is a Y cable or adapter necessary. This page explains that in most cases, this is in fact not required. Do I Need a Y Cable or Adapter for my Subwoofer? It is actually quite common for those setting up a subwoofer to seek a Y cable or adapter for the left and right input connections on the subwoofer. However, in most cases this is actually not the optimum method to set up your subwoofer. Almost all AV receivers and pre-amps will feature an LFE (Low Frequency Effects) output. The LFE channel is a mono signal and is already filtered before the signal is sent to the subwoofer. Almost all subwoofers will be equipped with an LFE mode. Most will be labelled with LFE next to one of the inputs, which in most cases is the left input. If your subwoofer is not labelled you may need to refer to your user manual for confirmation. To utilise the LFE channel in the correct manner would mean that you connect a single cable to the LFE input on the subwoofer. You should also dial the crossover control (low pass filter) on the subwoofer to the maximum setting. This is due to the fact that in LFE mode, the AV receiver or pre-amp has already taken care of this for you. The left and right inputs on a subwoofer are actually designed to receive a full range stereo source. This is when the crossover setting on the subwoofer would need to be calibrated according to the rest of the system environment. In this scenario, the subwoofer can filter out the low frequencies and then pass on the higher frequencies. 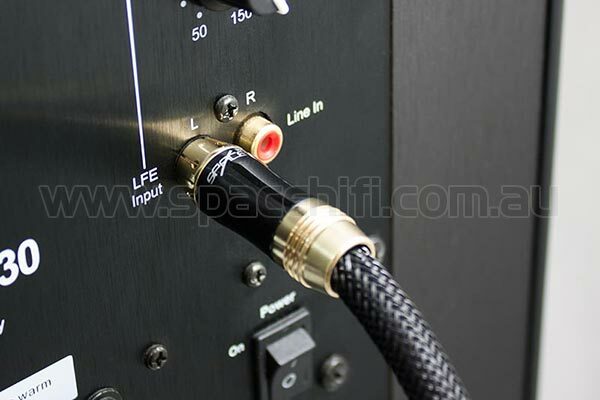 In almost all cases, a single RCA Subwoofer Cable would be the correct choice for your home theatre system. Why Does my Subwoofer Sound Better When I Use a Y Cable or Adapter? We often incorrectly associate an increased level in volume as sounding better. Some subwoofers may indeed display an increased volume output level of 3dB when a Y adapter or cable is implemented. However, this does not increase the maximum potential output volume of a subwoofer and only serves to bring the subwoofer 6dB closer to clipping the internal preamp and 3dB closer to reaching the dynamic output limit of the subwoofer. The exact same effect can be gained from adjusting the volume control. Does a Directional Cable Offer Any Benefits? Some manufacturers claim that their cables are directional (must be connected to the source with the arrow pointing outward). With the exception of active cables (these feature an integrated circuit), in almost all cases this is a false science. As the cables which form part of a home audio system handle AC (Alternating Current), this fact alone should put to rest any claims of a directional cable. As the name suggests, AC basically means that the electric charge flows in an alternating direction and not in a single direction, as would be the case with DC (Direct Current). However, an active cable does indeed require connection as indicated by the labelling. As this type of cable features an integrated circuit usually designed to boost signal strength (commonly found on longer HDMI cables), the cable will only work when connected in the correct direction. In reference to "directional" RCA cables, the theory behind this is that any potential interference is induced into the outer shield, therefore by disconnecting (lifting) the shield at the source end, this prevents the interference from travelling any further. Unfortunately, this also breaks the circuit. In order to once again complete the circuit, the inner conductor which is usually only connected to the centre (hot) pin must be modified. In this instance a twisted pair would be implemented with one of the pairs connected to the centre pin and the other connected to the outer contact. While this indeed once again completes the circuit, this also completely defeats the purpose of disconnecting the shield in the first place. Another point to consider is that some manufacturers don't even bother with the procedure outlined above and instead place arrows on their cables in an attempt to create a false benefit. This is generally more applicable to budget cables. However, this is most certainly not limited to any market or type of cable as some speaker cable manufacturers also make wild claims as to the benefits of a directional cable and as such attach an extremely high price tag for this non existent attribute. Instead of placing hope on snake oil and fictitious claims such as this, we strongly recommend that instead you consider cables of high build quality which include a range of attributes that have proven benefits. Some examples include high quality shielding, pure copper conductors along with quality termination and an overall high standard of workmanship.